A forum in Mahtomedi next month will size up the proposed Sandpiper Pipeline, and all sides of the debate will be represented, including organized labor. River Valley Action will sponsor the forum, entitled “Mixing Oil and Water? Perspectives on the Sandpiper Oil Pipeline,” from 7 to 8:30 p.m. April 13 at White Bear Unitarian Universalist Church, 328 Maple Street. 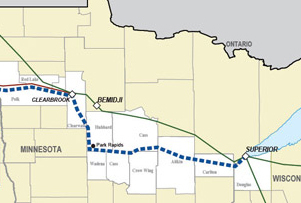 Sandpiper is Enbridge Energy’s proposed $2.5 oil pipeline across northern Minnesota, currently under review by the Minnesota Public Utilities Commission. If approved, the pipeline would link the oil-rich Bakken region of North Dakota with Superior, Wis. – and create an estimated 1,500 construction jobs. The proposal has drawn opposition from some environmentalist groups, but the Minnesota Building and Construction Trades Council supports the pipeline, arguing it will ease congestion in the state’s rail system, reduce the risk of rail accidents in highly populated areas and boost northern Minnesota’s struggling economy. At the forum, Deborah Pile of the Minnesota Public Utilities Commission will provide an overview of the project and the review process, then moderate a discussion among panelists representing Enbridge Energy, the Minnesota Pollution Control Agency, the environmental group Friends of the Headwaters and Local 49 of the International Union of Operating Engineers, a union supporting the project. Following the panel discussion, attendees will be encouraged to contact decision makers and let them know of their concerns and expectations. River Valley Action is a group for citizens of the St. Croix Valley area who value a healthy and informed civic community. The nonpartisan group is “associated with labor unions, nonprofit organizations and faith communities,” and it focuses on public policy at the state and local levels. For more information go to www.RiverValleyAction.org.